Last October, after Scotland's bruising 2-1 Nations League defeat in Israel, we asked if humiliation in Haifa was the worst 90 minutes as a Scotland fan. Apparently it wasn't. 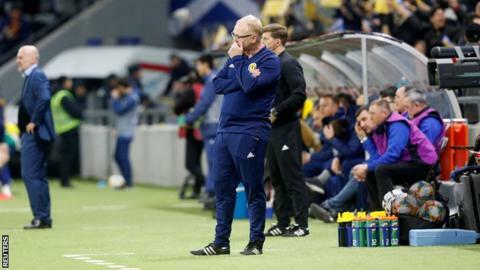 On Thursday afternoon, Alex McLeish's hapless side were two down inside 10 galling minutes against Kazakhstan - the world's 117th best side - and staggering around the Astana Arena in the manner of drunks chasing the last bus home. A third goal just after the break confirmed a defeat that former Scotland defender Willie Miller described as "embarrassing and disinterested". These two trips to Cardiff merge into the one mass of horror. In 2004, a rampant Wales side ripped Berti Vogts' Scots apart in front of 47,000 at the Millennium Stadium. Robert Earnshaw scored the first of his hat-trick within 60 seconds. And a change of venue didn't improve matters much five years later. The Cardiff City Stadium hosted another humiliation as David Edwards, Simon Church and a young starlet called Aaron Ramsey inflicted a fourth consecutive away defeat on George Burley and ultimately cost him his job. But this, the Scots' seventh friendly defeat on the bounce, was brutal. A penalty, a 30-yard screamer, and Steven Pressley skelping the ball off David Marshall and into his own net was the long and short of it. Only 16,000 were at Hampden to witness this horror show, played out by a Berti Vogts team including the likes of Darren Fletcher, Barry Ferguson and James McFadden. It might only have been a friendly, but the performance, the fact it was at home, and the general malaise that followed means this merits a place on the list. The Scots had the Caldwell brothers at centre-half, but they were made to look like the Mitchell brothers by the time Egil Olsen and his team were done with them. Brother number one (Gary) was sent off after just 33 minutes. Perhaps a lucky escape as he wasn't there to see John Arne Riise, Morten Gamst Pederson (2) and Erik Huseklepp pile on the misery. With just two games of the campaign remaining, Norway went on to finish second in the group ahead of Scotland on goal difference. To the untrained eye, there is nothing remarkable about this result. But the defeat was a landmark moment in Craig Levein's Scotland tenure. This was the night Scotland played a 4-6-0 formation in Prague, and got exactly what you would expect from a team fielding nobody in attack. Former Scotland striker John Robertson professed afterwards that his one-time Hearts team-mate "will get some stick". Not half, John. Not half. A dark, grey cloud hung over this Scotland showing in the sunshine state. Landon Donovan claimed a hat-trick in Jacksonville, Florida, against Levein's beleaguered Scots, whose goal came when Geoff Cameron turned the ball into his own net in front of a record crowd. At the time, 19 places separated the sides in the Fifa rankings, which pales in comparison to the chasm which divides the Scots and conquerors Israel. And we thought this was the worst. Scotland's defeat against the team ranked 94th in world was narrow only in terms of the scoreline. Even McLeish conceded it could have been more. Chuck in John Souttar's red card, and it all made for a pretty miserable night for the manager in the "roasting" heat of Haifa. A 3-2 victory in the return game secured Nations League play-off qualification so, actually, it did not cause too much material harm in the end. Two down inside 10 minutes, three down after 51. Hopes of automatic Euro 2020 qualification in tatters. All against a team ranked 117th in the world and with one win in their last 20 qualifiers. Well done, Scotland, you have set a new benchmark in haplessness.